C.J. Gable scored a pair of touchdowns as the Edmonton Eskimos closed out a disappointing season with a 33-24 win over the Winnipeg Blue Bombers Saturday. The glass was half full for Edmonton Eskimos head coach Jason Maas after Saturday's season finale. The Eskimos, knocked out of playoff contention last week, capped a disappointing season with a 33-24 win over the Winnipeg Blue Bombers. 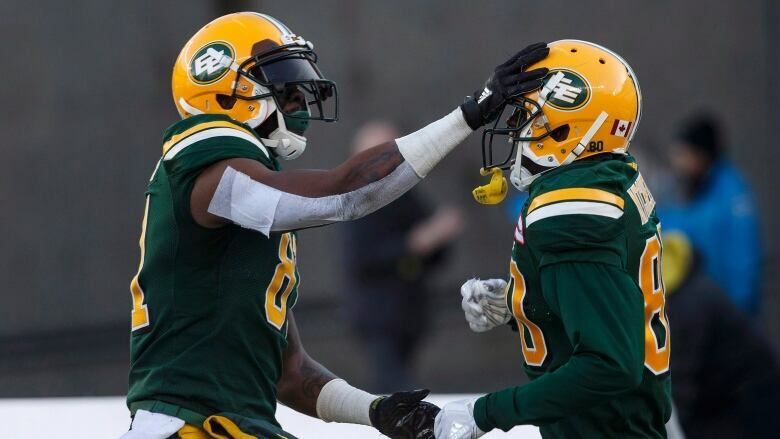 While the Eskimos (9-9) simply were playing for pride, Maas saw the effort as something special. "I love the group, but I've never been more proud of them the way they came together this week under circumstances that were out of our control," he said. "To go to work and still get something out of this and come together tighter than ever and then come out and win a football game against a great team, if you ask me ... it was a great ending to a week that was unexpected. But we made the most of it and that's something to be proud of." With their season now in the books, attention will turn to finding out the fates of Eskimos GM Brock Sunderland and Maas. There is also uncertainty about the return of quarterback Mike Reilly, who becomes a free agent. The Eskimos will hold a season-ending press conference on Sunday. Edmonton running back C.J. Gable scored a pair of touchdowns in a game that meant nothing in the standings for either team. The Eskimos began the season with a 6-3 record, but went 2-6 in their next eight games to miss the playoffs in a season where Edmonton is hosting the Grey Cup. Since the CFL went to an 18-game schedule, just two of 57 teams that started 6-3 have missed the playoffs. Winnipeg (10-8) gave several starters the game off or limited their action. The Blue Bombers finished third in the West and will hit the road for a division semifinal next week. "We feel we have as good of a chance as anybody," said Bombers head coach Mike O'Shea. "We have seen all season long that all it takes is a few plays here or there every single week, and those couple plays determine the winner. We are built well and playing good football." Winnipeg running back Andrew Harris made a brief appearance in the first quarter, gaining 35 yards to earn his second consecutive league rushing title. "At this point in my career, it is a great achievement," he said. "It is something you can take a lot of pride in." The Blue Bombers took a 3-0 lead on a 28-yard field goal by receiver Ryan Lankford, who was filling in as kicker for a resting Justin Medlock. Edmonton responded with a 17-yard TD pass from Reilly to a diving Duke Williams. Less than a minute later, however, Winnipeg backup quarterback Chris Streveler, who got the start with Matt Nichols getting a breather, connected with Corey Washington, who took off for an 80-yard touchdown. The Eskimos moved back in front on a two-yard TD run by Gable, putting him over the 1,000-yard rushing mark for the first time in his career. Sean Whyte nailed a 47-yard field goal to give Edmonton a 17-10 lead at the half and then a 25-yarder and a 38-yarder to start the third. Gable scored his second TD from 27 yards out early in the fourth. Johnny Augustine had a two-yard rushing major in response for Winnipeg, which then got a 29-yard TD run from Streveler to shrink the Esks' lead.